Some of you have probably noticed that I’ve been tinkering with the design of my blog for a few months now. Ideally, I would have ‘unveiled’ it all at once, but full-time work and many other commitments meant I could only tinker in short bursts. Last night I added a couple more features that I’ll outline below, but it did strike me that the new look is actually very different to how my blog started out. Annoyingly, I never thought to take a ‘before’ screenshot, but luckily I stumbled across one (albeit very low-res) over at Ohhh Lulu’s. I hope you agree that there’s quite a dramatic yet positive difference. I’m particularly in love with my ‘new’ header, which is actually made up of photos from vintage sewing patterns in my collection – I definitely need to get around to sewing up each one! About – contains my ‘story’ and contact details. Sponsor – I’ve finally taken the plunge in offering affordable sponsorship for crafty businesses and individuals looking to raise their profile. You can see how this works / looks from the static adverts already featuring on my right hand sidebar. But I promise that I will vet these carefully so they remain in line with your interests and so that they don’t compromise the integrity of this blog. 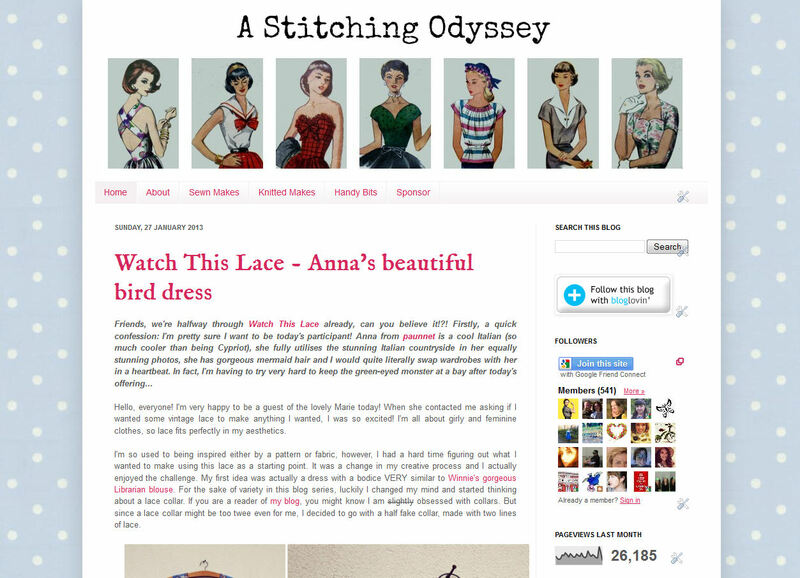 The eagle-eyed among you will also notice that I decided to change my blog name - I felt like A Sewing Odyssey was too one-dimensional considering I now dabble in knitting too...so A Stitching Odyssey was born. I'll be getting a shiny new url to reflect this soon, but don't worry, when the time comes you should just be redirected to it automatically. Feedback and thoughts on the ‘new’ design are more than welcome. Ultimately, I hope that you like it and that you find it easy to navigate! I love you header! The garment you chose are so perfectly vintage and beautiful! I love the new design with all those sassy ladies at the top! Absolutely love it! And the header tab taking you directly to all your makes is great - I've been trying to get around to doing that but I'm afraid my pages have all said "under construction" for way too long! I'm going to follow your lead and finally finish the makeover! Well done! Thank you! Blogging is more time-consuming than I ever imagined, so just take your time and you'll do it soon I'm sure! I love your new header. You have great taste in patterns (smile) and I can't wait to see them sewn up. I do see you've gotten rid of sewing blogs you follow. I always like that because I can find new blogs or ones I had forgotten about. Hope you'll add that back or make it a category someplace. 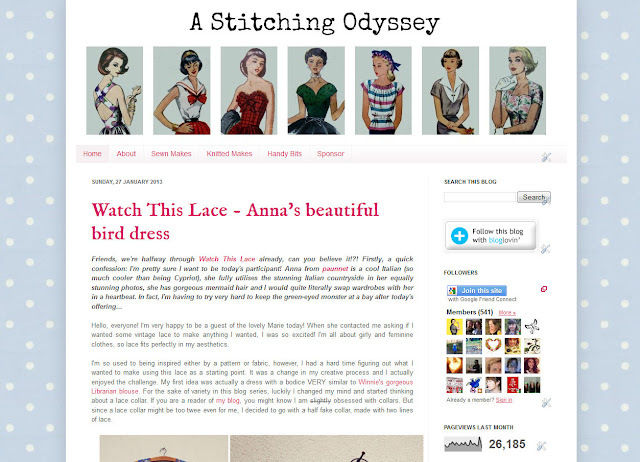 Exciting plans ahead for Stitching Odyssey! I did notice your new design and thought it was lovely. Actually, everything about this blog is lovely! Thanks Adrienne, that's so nice! Trust me Rachel, I've got very limited technical skills. My boyfriend actually had to centre my banner for me and I 'designed' it using picmonkey...haha! Think the new design looks lovely. Some of those patterns are gorgeous! One of the reasons I was initially attracted to your blog was your gorgeous header! You did such a lovely job with it! Loving all the new changes! Thanks so much, this is really good to know! I love your new blog design! I think it looks gorgeous. This looks gorgeous! I love all of your changes! I generally read blogs in a reader, but I had to come check this out, and the design is lovely!